NO DILEMMA OR LIVES IN A DILEMMA? 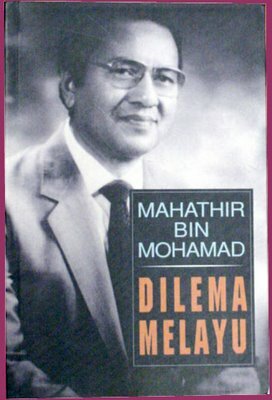 Are the Malays in our beloved MALAYSIA still very much in a DILEMMA - 41 years after the book on the same subject was written by our ex-PM Tun Mahathir? In 2 weeks time we will be celebrating our 54th year of MERDEKA and yet the MALAYS are still in a dilemma .... the Malays are said to have no real JATIDIRI (the English translation of the word will not be very exact), they are easily swayed, can be easily influenced, can be bought .... hence when there were Moslem Malays who attended a christian function in a church and a raid was conducted by a state Islamic Religious Department, there are comdemnations not from the christians and other non-Moslem Malays but from the Moslem Malays themselves .... and what is most disheartening .... resistance from some of those who called themselves Malay (Moslem) leaders!!! And when ... a northern state under the controlled of an ULTRA-KIASU party released a FATWA banning mosques (suraus as well I supposed) from playing-back recorded Al-Quran recital before dawn prayer, it was heartily supported by the Malay leaders who are still in a DILEMMA, no JATIDIRI; they do not know who they are .... always kowtowing to the ultra-kiasu leaders! Talking about the Malay dilemma ; it is a never ending story. This ethnic group of people will ALWAYS be in a dilemma; either a dilemma stemmed from their own doings or from the nons. Since the Malays are forever a generous, ever willing to give and compromise people, their dilemma will ALWAYS be there. Hopefully, the Malays in our Land of The Malays (no more) - the Tanah Melayu will not be in the same predicament as their brethren in The Lion Land ... where everything is LOST forever - land, power & dignity! Siapa Berkuasa Dia Tulis Sejarah. Mat Indera & Mat Sabu ada sama ka? Tangguh kes Anwar ke 666 kali !!! Apa Itu BOSS ??? Siapa Itu BOSS ??? JomBALUN. Awesome Inc. theme. Powered by Blogger.